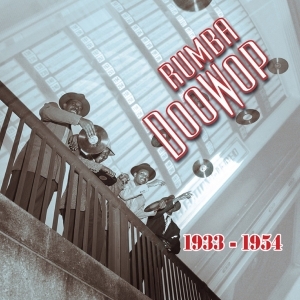 This 2-CD set is the first of a two-volume collection looking at the influence of latin rhythms, and notably the rumba, in the doowop vocal group strand of American R&B music during the decades either side of the Second World War. Africa and Latin America together have moulded American popular music since the beginning of the twentieth century. African influences have led to the development of jazz, gospel and blues while their rhythms have been largely determined by successive waves of dance music from Cuba, Argentina, Brazil, Mexico, Puerto Rico and Jamaica. Every American musical genre from Broadway stage, Hollywood film, Tin Pan Alley pop and even country music has been affected to some degree. Dance forms and musical stylings such as habanera, bolero, tango, rumba, conga, samba, baion all have their origins in the Caribbean or in Latin America. New Orleans has been responsible more than any other city in the world for shaping the sound of twentieth century popular music. A sweeping statement that may seem, but as the birthplace of jazz, funk and arguably rock’n’roll, it really has no other contenders. At the heart of these three widely different varieties of music lies the rhythmic complexity of second line parade drumming. Its two-beat patterns combining military band and Caribbean rhythms underpin early jazz recordings much as they do those of Little Richard and James Brown. It is in this parade band beat that the first intimations of early funk drumming can be heard. This collection brings together over sixty recordings featuring vocal groups from every facet of American popular music, including of course the ubiquitous gospel quartets and the barber shop styled groups of the 30s, through to the groups that were at the heart of the booming R&B market in the early ‘50s, who would provide part of the transition to rock ‘n’ roll. With carefully restored recordings and complete with a comprehensive 24-page booklet providing a detailed background narrative and discography, this is once again an absolute must for enthusiasts and collectors of classic R&B.